Accounting software company Xero is holding its Xerocon conference in Auckland, New Zealand on 20-21 February, 2014. Xero is valued at NZ$5bn, which makes Xerocon a really big business event on the New Zealand calendar. At the event Xero’s leadership will map out the company’s progress and strategy for global growth, as well as providing guidelines for software developers and accounting partners who use the Xero platform. Social media has always been a big marketing channel for Xero, and they are big fans of Strea.ma. 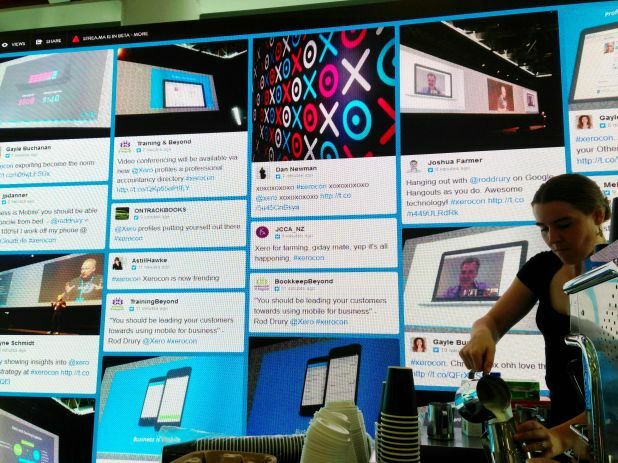 Here you can see a Strea.ma wall behind a coffee stall at Xerocon (thanks, OG!). You can see the Xerocon wall right here.